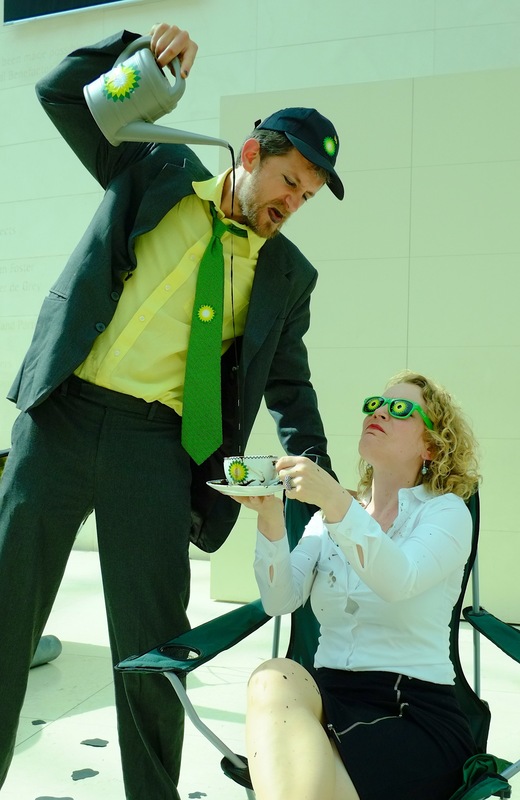 Actor-vists are occupying the British Museum – BP or not BP? Posted on July 19, 2015 by BP or not BP? Today at 2.30pm, the theatrical action group BP or not BP? began a protest performance inside the British Museum. 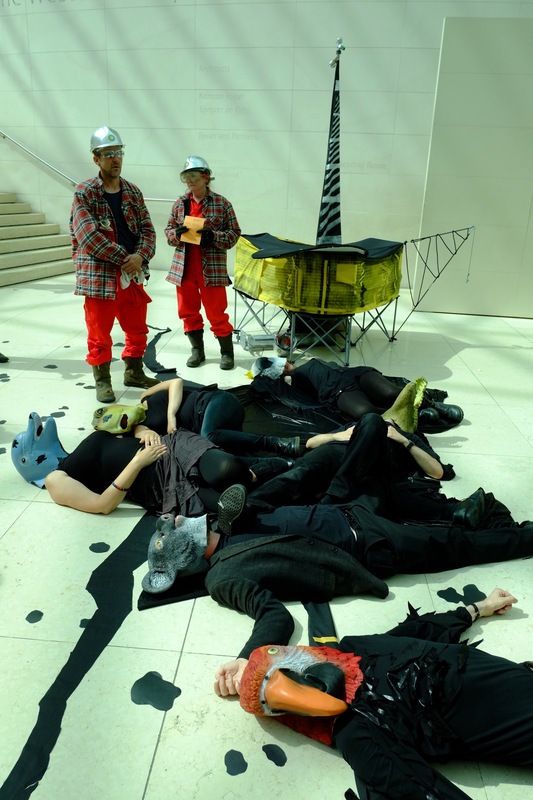 The unsanctioned performance – which is still ongoing – has blocked the main entrance to the Museum’s controversial “Indigenous Australia: Enduring Civilisation” exhibition, which is sponsored by BP. Oh no! Our BP drilling rig suddenly exploded, causing a huge oil spill all over the Museum’s floor. Photo by Hugh Warwick. The “actor-vists” are using a mixture of theatre and storytelling to hold the space, and have drawn a hundreds-strong crowd. Visitors are being invited to join the performance, which the campaigners plan to continue for the rest of the day despite warnings from Museum security. The British Museum was in thrall to BP, who made sure she was distracted from all the problems with the exhibition and its sponsor. Photo by Hugh Warwick. The performance accuses the British Museum of “not listening” to criticism of the exhibition, which has focused both on the choice of sponsor and the inclusion of objects stolen from Aboriginal communities. A new Freedom of Information request by BP or not BP? 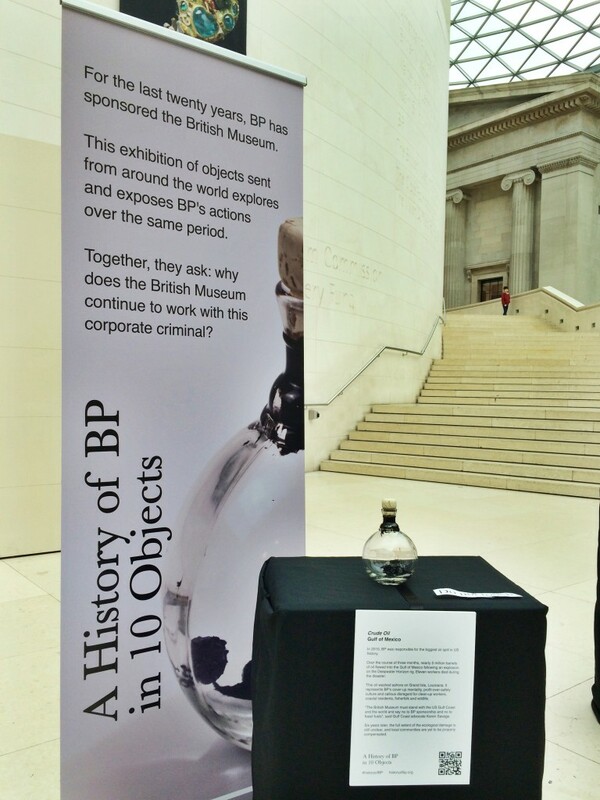 has revealed that the majority of the communities whose objects are featured in the exhibition were not informed that BP would be the sponsor. Despite claiming to have carried out consultation with all the Aboriginal groups involved, only the two whose artefacts feature on the exhibition posters were told that their objects would be displayed alongside the logo of the controversial oil company. A number of Aboriginal leaders have called for the repatriation of significant objects featured in the exhibition, most prominently the Dja Dja Wurrung people in central Victoria who have already taken unsuccessful legal action against the Museum for the return of their rare bark art. The wording used in the exhibition has also come under fire, with one display describing colonialism as a “misunderstanding”. So much wildlife has been killed by BP’s drilling, spilling and emitting. Photo by Hugh Warwick. BP’s massive contribution to climate change is putting the future of Indigenous communities in Australia and around the world at risk. BP is officially the world’s biggest corporate criminal, following a record-breaking $4.5 billion legal payout in 2012 and a further $18.7 billion fine earlier this month, for its role in the catastrophic Deepwater Horizon disaster. Despite this, the oil giant plans to drill four new ultra-deepwater wells in Australian waters . The Museum receives just 0.8% of its income from the oil giant, yet the company’s logo features prominently around the building. Today’s action is the latest in a series of creative protests accusing the British Museum of giving BP legitimacy while the company continues to extract fossil fuels and lobby against climate action. The five-year sponsorship deal is up for renewal early next year. In April, the UK-based group disrupted the press launch of the Indigenous Australia exhibition with a protest against ‘Stolen Land, Stolen Culture, Stolen Climate’, the photos and film of which went viral in Australia. 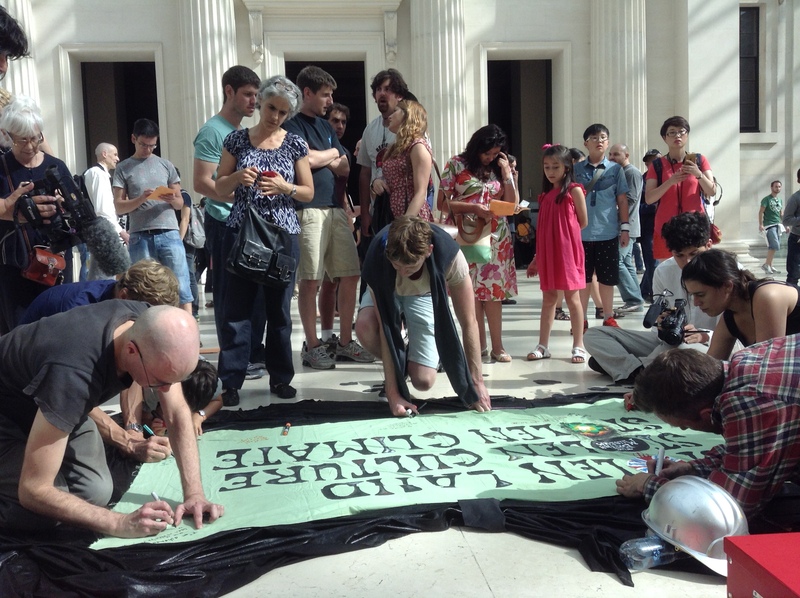 Museum-goers joined us in writing messages of solidarity on our banner which we will send to Indigenous communities when they protest the arrival of the exhibition in Australia. Photo by Chris Garrard. The “British Museum” is attended at all times by a sinister BP character, who keeps the Museum distracted from the chaos unfolding around them with the use of BP-branded dark glasses and ear muffs, as well as handfuls of dirty cash and a cup of suspiciously black and oily tea . You can’t clean up an oil spill – long-term damage to wildlife and the ecosystem is inevitable. Photo by Hugh Warwick. Following this initial performance, the group have now occupied a large area at the base of the steps leading up to the BP exhibition, and are inviting the crowd to join them as they tell stories about climate change, oil companies, and colonialism in an attempt to catch the attention of the “British Museum” character. This part of the performance is still ongoing, and the performers are also distributing British Museum feedback forms to the crowd and asking them to fill them in to let the Museum know their thoughts on the sponsorship deal and the exhibition. 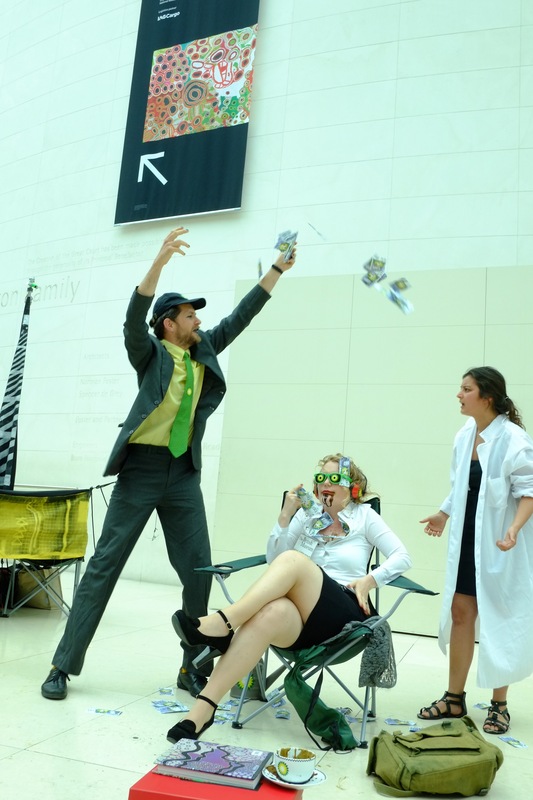 The museum totally ignored warnings from the climate scientist – she was too busy being showered with money by BP! Photo by Hugh Warwick. This is BP or not BP?’s 13th creative protest inside the British Museum. The protest is an expression of solidarity with Aboriginal communities who are still struggling for the right to live on their traditional lands since the British first invaded Australia and stole their land. Australia is currently witnessing the growth of #SOSblakaustralia, a mass protest movement challenging a decision by the regional government to forcibly close 150 “homelands” in Western Australia – remote communities where Indigenous peoples live on and look after their traditional lands . 1. According to the FOI request: “The British Museum consulted with the communities in the two cases where objects related to those communities were to be used on posters and advertising where sponsorship crediting was included. Both communities were advised of the sponsor and gave permission for the images of objects to be used. The sponsorship arrangements were not discussed with other communities. The sponsorship was made public on 22 January 2015; consultation with the communities had been completed at this point as there are lengthy lead-in times for exhibition development.” The documents can be seen here. 2. BP currently plans to drill four new wells in the Great Australian Bight, an area off the south coast of Australia. These waters are far rougher, and far more remote than the Gulf of Mexico. That disaster was in 1.5km of water. In the Great Australian Bight BP could be drilling in waters far deeper, which are also a whale nursery and sanctuary recognised internationally for southern right whales and their calves, blue and humpback whales and Australian sea lions. BP has already admitted that the best case well blowout spill scenario would result in pollution potentially stretching for 760km. 3. The full script is below. A character representing the British Museum arrives with a folding chair and a box under their arm. They are dressed smartly and blandly in a suit, with a big badge saying ‘British Museum management’ on it. They sit on the chair and put the box on the floor in front of them. It says ‘British Museum feedback’ and has a slot in the top for forms. They remain sitting there for a little while, smiling and waving to passers-by. Suddenly the low sound of drilling can be heard, near the base of the stairs, made by multiple voices. 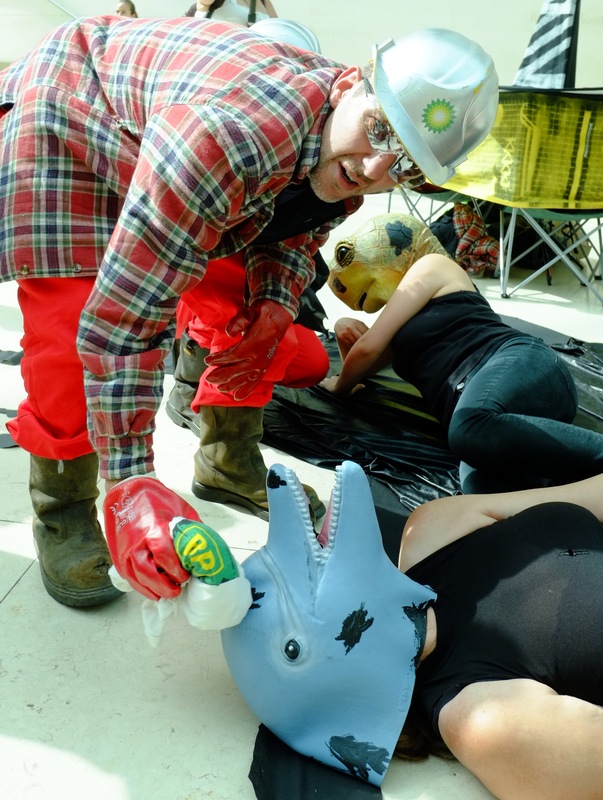 The noise gets louder and more violent, as a figure appears, wearing an oil-spattered hazard suit, drilling into the museum’s marble floor with a fake drill. Suddenly some of the voices make a cracking, splintering sound. Black cracks appear on the museum floor, made of fabric rolled out by more oil workers in hazard suits. 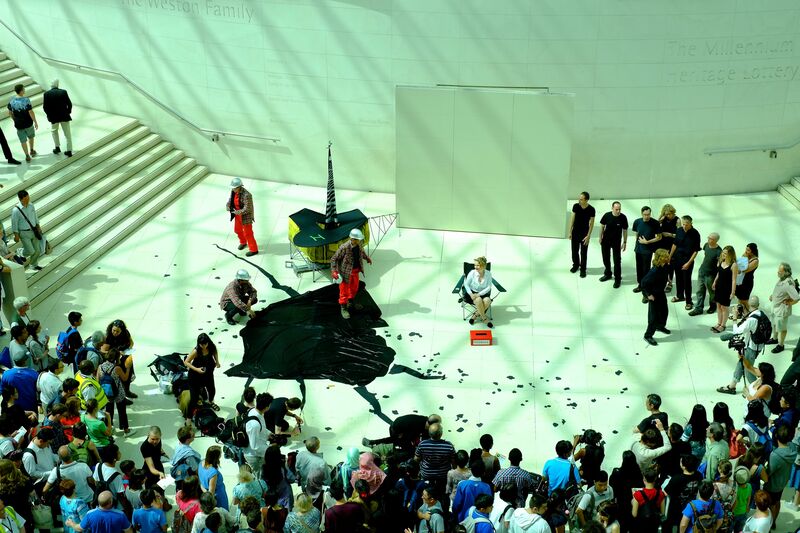 A fabric spill appears at the centre of the crack and someone throws hundreds of black paper ‘oil-blots’ from halfway up the stairs, giving the whole area an oil-spattered look. Throughout the rest of the performance the oil workers add to and maintain the spill so that it gradually grows. The oil worker reels back, appalled at the mess they’ve made. There’s oil everywhere. Devastated by the mess they’ve made, they approach the museum representative, blackened arms outstretched. Oil worker: Why aren’t you listening to me? Why are you ignoring the evidence? I give up! Then from another side, a colonial explorer in khaki shorts, shirt and pith helmet appears with a huge sack with the word ‘ artefacts’ on the side, and a copy of the exhibition book. He arrives to a fanfare of ‘God Save The Queen’ recreated by the choir. He is sinister, not jovial, and is here to do business. And you, British Museum – you’re happy to benefit from this? This exhibition contains just 1% of the stolen Aboriginal objects you keep locked away, refusing to return them to the communities that want them back. Your exhibition rewrites history, calls colonialism a “misunderstanding”, misses out key moments in the Aboriginal black activist movement – and you didn’t even tell the communities whose objects you’re displaying that an oil company would be sponsoring the exhibition. This is a shameful part of our history that we need to face up to and make amends. Where are your ethics, British Museum? Why aren’t you listening to me?! The Explorer and the Audience Member leave, still bickering. The book and bag stay at the BM’s feet. The British Museum looks slightly perturbed, but is soon relaxed by being given a cup of tea by BP, who pours a black oily liquid into it from a petrol can, which the BM drinks, allowing the oil to trickle down their chin onto their nice white shirt. It looks gross. Suddenly, from near the oil spill, animal noises begin, quietly at first, then getting louder. They are mainly whale, dolphin and bird sounds, and as the noises rise, several Creatures appear at the spill site, dressed all in black wearing animal and bird masks. First they swoop around and then they get sullied and stuck in the oil. They gradually drag themselves to the feet of the BM character, squawking and flapping to get their attention. But BP has got there first. The BP character first places BP-branded earmuffs over the BM’s ears so they can’t hear the noise, then proceeds to shoo the dying creatures away from the museum and back to the oil spill where they’re covered with black cloth so they’re almost out of sight [at this point the actors remove the heads and leave them in the spill]. Then a Climate Scientist appears. She starts talking to the BM as if she’s giving a lecture, but gradually gets more emotional, personal and angry. Climate Scientist: The global scientific consensus is clear – dangerous climate change is happening, it is being caused by burning fossil fuels, and if we do not transition away from coal, oil and gas very rapidly then the consequences for the planet will be very significant. We are talking about dramatic changes to temperatures, weather patterns, sea-levels, water supplies and ecosystems that will cause immense human suffering. Yet companies like BP are using their political influence and their immense wealth to prevent climate action so they can continue extracting every last drop of oil. They have a business plan for the end of the world and they need to be stopped. So why on earth, British Museum, are you allowing them to put their logos all over your prestigious exhibitions? You are giving them a legitimacy that they do not deserve, and as a result, actively preventing effective action on climate change. Why are you ignoring the world’s scientists? You’re supposed to be an institution that keeps to the highest standards of academic rigour! This is ridiculous! Unfortunately, the BM isn’t listening because BP is standing on their other side, distracting them with a load of oil-stained banknotes which it is gradually stuffing into the BM’s top pocket, pleasing them both no end. The Climate Scientist slopes off, head in hands. Then a few people step forward holding an Aboriginal flag. They read out statements from Aboriginal people critiquing the exhibition and its sponsor. The BM continues not to listen. Then the MC steps forward. They will control proceedings from now on. Actorvist MC: The British Museum isn’t listening. It is ignoring the fact that BP is the world’s biggest corporate criminal. It is ignoring the Aboriginal communities who want their stolen objects back. It is ignoring the reality of climate change, and the need to leave fossil fuels in the ground. We need to make the British Museum listen. Join us today, while we tell stories about why we are so worried about BP sponsorship, and if you share our concerns, fill in one of these feedback forms, post it in the box [still at the BM’s feet] and we will deliver them to the Museum. What a beat up! A few people standing around in costume outside an opening does not constitute a “disruption”. A couple of people from one State taking a different path to securing repatriations does not make a groundswell of anti-exhibition feeling, although they now seem to have done a good job of getting white support for their cause. More of our people are about to arrive there to see the exhibition, so let’s hope for the protestors sake they have found something else to do by then. Do we love mining our lands? No we don’t. Do we drive cars and bikes that use the products of mines? Yes we do. Heather Sculthorpe, sister of BM exhibition curator and long-term Aboriginal rights activist.